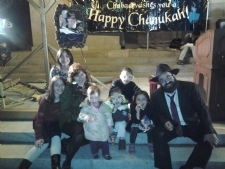 Rabbi Mendy and Dinie Cohen founded Chabad of Sacramento in 1994. Since it's inception, they have developed 6 more Chabad houses in the area. Prior to moving to Sacramento, Rabbi Mendy Cohen studied Jewish thought and practice in Montreal, New York and Jerusalem. He has excelled in furthering his studies in Sacramento and has become a Rabbinic Judge (dayan), as well as written and published a book on Jewish law. In addition to advancing in his own scholarly persuits, he is an incredible teacher who gives classes at the Chabad house several times daily. His internet series, "Parsha Power", has become popular all over the world due because of the amount and depth of information he packs into under 10 minutes. Check out Parsha Power here. Dinie Cohen focuses her passion for education by directing the famous Camp Gan Israel every summer, heading the Chabad Hebrew school, teaching classes for women, as well as educating her own eight children. She also has reputable taste which shines through all the wonderful Chabad community events she plans.